Everyone’s favourite sharp-tongued, loveable gossip returns to the Edinburgh Festival this year with his new show Can’t Think Straight. Stephen Bailey will be performing at the Laughing Horse @ The Free Sisters throughout August. I feel like the Fringe is the end of year disco. And then September you get to start a fresh and I love it. I have a surprisingly mainstream audience. Everyone comes – male, female, young, old (71-year-old Bob in Southend is obsessed with me), straight, gay. I love it. When a toilet exploded into the carpet and human faeces leaked into said carpet and the landlord wouldn’t do anything until we left at the end of August. Finally feeling like I was being taken seriously as a comedian and I must say that came from Katherine Ryan very generously taking me on tour with her when no one else would have me. Eggs Collective, Evelyn Mok, Ellie Taylor, Grainne Maguire, Jayde Adams, Charlotte Church and just when you think I only love women, I’m going to see the pro that is Rich Wilson. I’d really like just to keep building that audience. I’d also like to eat a lot of takeaways with my roomie Jayde Adams. Just have a laugh. It’s a comedy festival. I hope it never ends. But I’d love to be doing a show one day where we’re laughing back at how stupid we used to be at voting #Brexit #Trump. Stephen Bailey has been busy lately, especially given his recent support slot on Katherine Ryan’s latest tour. 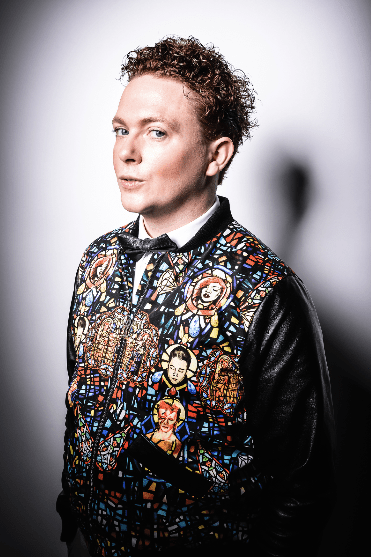 This comedian is cheeky, flamboyant and a prime example of someone who is destined to perform in some medium or other; his recent successes on the live stand up circuit prove this to be the case. Stephen is taking his latest solo hour, Nation’s Sweetheart, to this year’s Edinburgh Festival. Perhaps a bit late to the party, as her DVD record at the Eventim Apollo is due to take place the following night, hundreds of fans flock to Birmingham’s Town Hall to see Katherine Ryan’s critically acclaimed and Chortle Award-winning show, Kathbum. Ryan varies her support acts throughout each tour, and tonight’s warm-up entertainment comes from Stephen Bailey, who, as Katherine rightfully states herself, better fits the criteria for a headline act than a support slot these days in terms of competence in performance. Stephen is a wise head on young shoulders; reassuringly secure in himself and his act in a way that enables him to take an audience under his wing. With an attitude of confidence and independence, blended with a humorous suggestion of neediness, Bailey’s material is slick, but not so slick that audiences have difficulty warming to him. Katherine Ryan has blossomed over the past year and this is clear from the moment she walks on stage, greeted by bellowing cheers of excitement and endearment. She appears surprisingly relaxed, but humble, explaining her reasons for always bringing a support act with her on tour before progressing towards the heart of the show. This comic is constantly developing as a writer and performer, which is some feat considering how smart and cutting her comedy has been since her first UK tour in 2013. This latest show is about evolving as an individual as those we grew up with do the same, and the inevitable drift from those we used to relate to. Ryan uses this as a tool to discuss issues relating to overcoming the judgements of others and being assured enough in ourselves to make the decisions that are best for us. The somewhat-obsessive interest in celebrity culture is still apparent, serving as a metaphor for greater issues in society such as racism and misogyny. Katherine’s comedy is self-aware in a triumphant sense, rather than a defeatist one. Her craft is admirable, with each narrative carried out to its conclusion and perfectly timed callbacks that fit into the performance, rather than shape it. She is professional, yet personal; brutally honest but not irrational in her cutting remarks with each issue being clinically dissected and evaluated before any ill-informed opinions are able to be expressed. And whilst she may introduce challenging concepts, Ryan always has her audience’s best interests in mind, assuming an almost-maternal role that shines through brightest when she talks directly to young female audience members; whom we might deduce to be her target demographic. Katherine Ryan is not fazed by anything, it seems, whether that be hecklers or significant life events. The quality of her craft is creatively motivating; the content emotionally uplifting, whilst remaining delightfully unpredictable, accessible and genuine. Is Birmingham Glee Club the best comedy club in the country? Quite possibly. The latest ‘Best In Live Stand-up Comedy’ show at the Glee is a showcase of four acts as well as compère Andre Vincent. Stephen Bailey has a rare charm about him. A young face paired with an air of experience makes for a very enticing performer. He speaks with a quiet confidence that suggests this man is a born performer; showing an aptitude for conversing with an audience as a collective. There is an undeniable hint of showbiz behind Stephen’s demeanour but also an endearing realism. With a twinkle in his eye and a manner that suggests both innocence and filth, this comedian seems to demonstrate experience beyond his years. And, having recently supported Katherine Ryan on her UK tour, that comes as no surprise. Harry Stachini only began his comedy career in 2013 and has evidently been doing his homework. With admirable competence in front of a rowdy crowd and an obvious appreciation of joke and narrative formation, Stachini was indistinguishable from the other acts on the bill in terms of quality of material and stage presence. Next up comes Gareth Richards with an interesting blend of odd mannerisms and relatable observational material. With a silly and playful tone, an audience feels instantly obliged to humour him, although he is well aware that some of his crafted punchlines are cheesy and the addition of a musical interlude helped to maintain this illusion of a somewhat variety act. Richards throws in frequent narrative curve balls whilst playing up to a ‘loser’-status that ensures his audience is on board from the very first, “Everyone say hello to Gareth”. And finally Andrew Bird; self-depreciating and confessional, Andrew appears to be the voice of reality, accepting and embracing the turmoils of relationships, fatherhood and technology. His qualms about society are both easy and enjoyable to follow. Bird gets caught up on many of modern life’s minor irritations, picking up ideas and running with them with impressive energy.